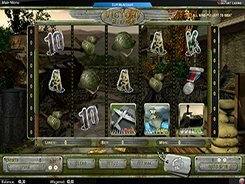 The 5-reel 9-payline Arthur’s Quest slot developed by Amaya offers a lot of special features including three bonus games and a wild symbol. The visuals are kept intentionally simple looking like children’s book illustrations, and this gives some sort of charm to the game. The symbols used are somehow associated with King Arthur legends and incorporate a wizard hat, a golden cup, a black horse, Excalibur, and also the most prominent characters of the Arthurian legends. 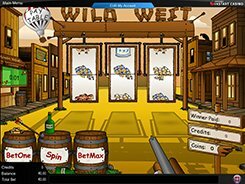 The bet range caters for every budget since you may place just $0.09 per spin or increase your bet up to $225. The bonus games are triggered when 3+ identical bonus symbols land on adjacent reels. In the Sword in the Stone feature you are to pull the swords and win multipliers until you reveal the ‘Finish’ word that ends the feature. In the Pick a Spell bonus game you are invited to pick one of Merlin’s spells to reveal a bonus cash amount. In the last feature known as the Enchanted Dragonfly you should do nothing but watch a magic frog catching dragonflies that award you random coins. 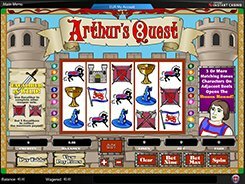 The largest jackpot prize you may win in Arthur’s Quest is 2500 coins (or $62,500 on the maximum stake). PLAY FOR REAL MONEY!